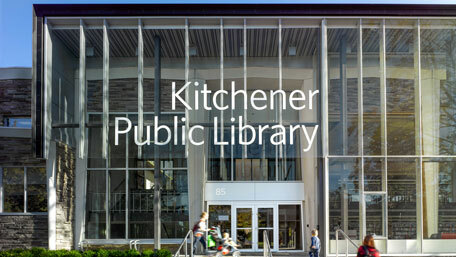 LGA Architectural Partners wins Ontario Library Association Library Building Award for their transformational redesign of the Kitchener Public Library. Kitchener is one of Canada’s fastest-growing communities, catalysed by its universities and high-tech industry. Built in 1962, the city’s Main Branch Public Library was not only showing the effects of everyday wear and tear, it had reached an age when its major systems and components needed replacement. 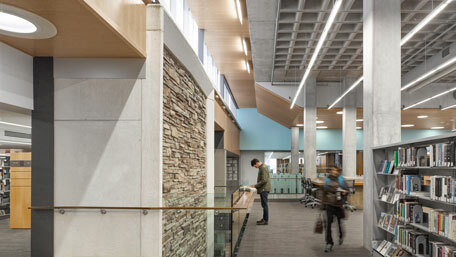 The library was designed at a time when energy costs were low and awareness of greenhouse gas emissions did not exist. The librarians tasked LGA Architectural Partners to preserve and expand the original structure while making it sustainable, accessible and elegantly robust — a must for a building that serves 107,000 cardholders. They also asked that the building’s design support the transforming library mandate from “reading and researching” to “meeting, making and active learning”. The architects’ big move was to wrap the original mid-century modern library with a high-efficiency curtain wall with operable windows, thereby preserving the building’s iconic image while dramatically upgrading its performance, targeting LEED Gold certification. The glass opens the interior to natural sunlight and air, and converts the main reading room into a “front porch” that invites community and engagement with the street. At night, the glass wall all but disappears, allowing passers-by to appreciate the concrete, chevron-shaped arches of the original design and inviting views of the activity within. But the façade also celebrates the library’s contemporary image: charged with fluctuating, colourful LED lights, it whimsically references the library’s foundational imagery—books on a shelf. 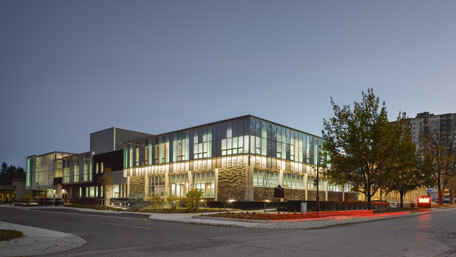 Adding to both the rear and a second storey, the architects expanded the facility from about 95,000-120,000 sq.ft., creating space for a wide variety of open and closed rooms for group and solitary learning. Labs with glass walls expose the making of things, including a digital lab with a 3D printer, an electronic die cutter and make-your-own music stations. They added a wide variety of seating options including couches, tables, laptop bars and in-shelf nooks, reflecting the myriad of ways in which people inhabit and engage within a contemporary context. Wi-Fi, computers and power outlets are discrete but plentiful, while books — still a key resource — are prominently displayed on shelves with integrated display elements to invite interest. Reopened in September 2014 on a $46-million budget, and rebranded as the Central Library, the solution is modern, elegant and rich with history. It is now Kitchener’s great “living room”, an authentic, comfortable and flexible place ready to offer enriching experiences and a confident statement of both heritage and contemporary architecture for a region that is operating on the forefront of the digital age.